Homeowners across Canada are increasingly choosing architectural concrete pavements for their walkways, driveways, pool decks and patios. Concrete pavements can be very durable when constructed properly. It is important for you to obtain references and a written guarantee from your concrete contractor to ensure that they will stand behind their work. The granular base needs to be compacted uniformly without any soft spots. The slab thickness should be 4″ for foot traffic, 5″ for car parking and up to 8″ for large truck parking. The slab should be reinforced with welded steel wire mesh to avoid vertical movement at joints (must be supported above the granular base). For exterior concrete, the concrete should be a CSA Class “C2” mix for slabs on ground (32 MPa, 0.45 w/c, 5-7% air entrainment and freeze thaw durable aggregates). Note: A “C1” mix is required for exterior suspended slabs. For interior concrete, the concrete should be non-air entrained 25 MPa concrete including a maximum 0.55 water:cement ratio. Floors should be cast on a vapour retarder membrane with a reduction in concrete mix water while incorporating a non-air-inducing plasticizing admixture for workability. The concrete should be sawcut into squares within 24 hours of slab casting (spacing at approximately 25 times the slab thickness in millimetres). Curing should commence as soon as possible and should be maintained for a minimum of 3 days of possible (wet curing is ideal). Longer wet curing up to 7 days is beneficial to surface hardness. In exterior applications, avoid applying too many coats of sealer which can make the surface slippery when wet. 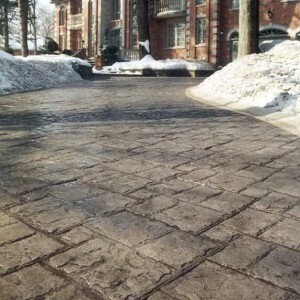 A fine slip-resistant aggregate may be mixed with the sealer for wet applications. Wash dirt and debris out of sawcut joints before and after winter. For new exterior concrete, allow one month of air drying prior to freezing (if possible). Obtain a written guarantee on the finished work. 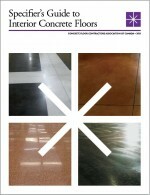 Please review on-line information on polished concrete and coloured concrete. Feel free to request a quote and we will contact you shortly. There are many exciting opportunities to specify a variety of floor designs and architectural finishes for new concrete floors and we welcome your questions by e-mail or phone (905-582-9825). Please refer to our Technical Area and Materials Library for additional Concrete Floor information. Please call (905-582-9825) or e-mail if you have any questions, suggestions or concerns.